Create an open and inviting atmosphere in your home. If you are looking for a way to make your pantry pop, our collection of kitchen countertops in Seaside, OR will bring your design ideas to life. We offer a full array of marble, stone, and quartz countertops that fit any design scheme. Come into our store today to learn about your exciting options and discover why homeowners everywhere trust us to install their countertops. Countertops serve as the focal point of a kitchen. This is one of the reasons that the selection of material is so important. The surface material sets the tone for this space, whether you want the space to say luxury, boldness, or stunning. Invest in the beauty and functionality of your kitchen so that your family can truly enjoy this space. After all, this is arguably the most popular room in the house. Why not make it as appealing as possible? Think of all the wonderful meals you can prepare with a new countertop installation. We invite you to stop by our store and talk to one of our sales and design professionals. These experts have extensive product knowledge, as well as design experience. Turn to our professionals for help in choosing the counter that works best for the style and use of your space. A beautiful kitchen does not have to be expensive. For those looking for an eye-catching and affordable option for their home, quartz countertops are the perfect solutions. Quartz is known for its beauty and durability, and this quality material requires very little maintenance to keep it looking new. It stands up to scratches and stains, making it a great material for families with children. These countertops are made from quartz with a little bit of color and resin mixed in. This provides a beautiful non-porous surface that is ideal for your kitchen as it resists spills and stains and is so easy to clean. In addition, quartz counters have no spaces where bacteria can grow or germs can hide. This makes this surface a clean choice for cooking. Sometimes, even one new feature can brighten your space. Marble countertops are available in a number of different finishes, including honed and polished styles. Any variety makes marble the perfect selection for kitchens in any décor style. In the kitchen, drops and spills are guaranteed to happen eventually. There is very little cleanup required with countertops made of marble. This material is easy to clean, and it features a fresh and unique look that complements your space. It also adds value to your entire home. Marble is a high-end surface material that is identified by the distinctive veining that runs through each slab. As marble is quarried from the earth, each piece is different so that your marble counters are truly unique to your home. This countertop material is prized for its elegance and originality, which only adds to its popularity. These countertops are easy for fabricators to work with as marble is a soft stone that they can cut into any shape that you desire, as well as making it easy to carve fancy edges. 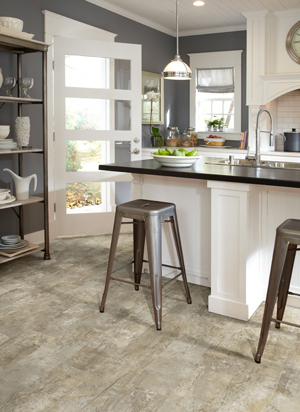 If you are looking for a modern spin on a classic favorite, natural stone is the ideal choice. Natural stone countertops by CAMBRIA™ are available in a wide range of options, including choice of material and color-- with each one making the perfect fit in your kitchen. Whether you are creating a bold new kitchen or updating the look of your existing space, choosing natural stone gives you a wide range of options. Because each countertop is made from a different stone, homeowners can create a one-of-a-kind look without overspending on a custom design. Talk with one of our sales and design professionals about which type of natural stone works best for you. Factors include the stone that you prefer, the design style of your kitchen, and how you would be using that space. Let our professionals show you samples from our countertop collection so you can see what you prefer. Once you've chosen the perfect materials for your home, it's time to enjoy the new look of your kitchen. Our experienced crews offer full countertop installation for any of our products. With our service, you will receive a quality installation of your quartz, marble, and stone countertops. Our team works quickly, yet efficiently, delivering a top-quality result without causing you to worry over completion times. Professional installation is necessary for long-lasting results. Cutting the surface material so that it fits precisely over your current cabinets and around the sink is essential for a polished look, as well as to keep water from damaging the cabinets or what you have inside them. With our experts doing the work, you can sit back and enjoy the beautiful results. Contact us today to browse our stunning selection of kitchen countertops. We proudly offer stone, marble, and quartz countertops throughout the communities of Astoria, Cannon Beach, Manzanita, and Seaside, Oregon, as well as on the Long Beach peninsula.